Jim I have been reading your posts for some time now. I thought I would reach out to you and ask your opinion on the development area plan in Pantops (Riverside Village/Hyland Ridge) and the effects it will have on surrounding real estate prices such as the Franklin Subdivision and Key West. Update: I’m not yet ready to concede blog comments to the Facebook empire, but there are some thoughtful comments there. My simple takeaway is that more growth = more traffic and congestion and the County is quite poor at planning for either. The County excels at planning (see the recent discussion about Pantops congestion), but executing – for myriad reasons – remains something seemingly always over the horizon. Being a home owner in the area I realize that traffic will increase some. However I’m more interested in what effect these types of developments will eventually have on the value of my home and the homes around it. People like to be close to things and with the higher listing prices for these luxury advertised new dwellings I would suspect home prices in the area would increase. However, part of the lure of areas such as Franklin and Key West have been that although rural, they were still close to town. So on the other hand I could see the negative effect it could have by eliminating the original attraction people had to these quite rural areas.I realize that the latter may be a less likely outcome, though merging urban development to the border of rural areas and the effects it has on real estate is not something I have experience with. It’s one thing to live in a rural area, and quite another to commute there. This applies to the rural parts of Albemarle that touch the more urban ones – Earlysville, Free Union, Crozet, North Garden et al. If I had to speculate, and I might as well, I think the appeal of the older neighborhoods adjacent to newer neighborhoods will increase nicely in value. 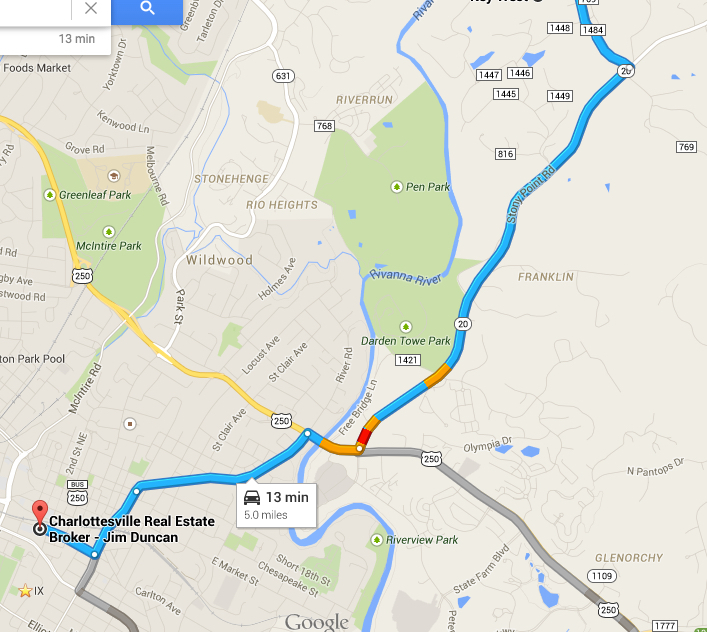 I’ve found that a lot of my buyer clients want new construction in the Charlottesville and Albemarle areas. A lot of people moving to the are looking for, while not necessarily older homes, they’re looking for trees. And grass. And established, mature neighborhoods. That are close to stuff. in order to compete with new construction – homeowners are going to have to update and renovate their homes. Remember – 85% of Albemarle’s housing stock was built after 1960. And “older” when comparing with new construction is either “older than two years” or “older than 10 years” (there’s some flex there, but you see my meaning). This means increasing energy efficiency, ensuring that homes’ functional obsolescences are mitigated, landscapes are more appealing than the red clay + sod of new construction – and trees and tree canopies are maintained and highlighted. Accentuate the outside spaces. 548 of those 625 have been on lots 1/2 an acre or smaller. Of those 548, 301 are attached homes. Looking at single family homes – 323 have sold in that timeframe; 247 were on less than 1/2 and acre. 174 were on less than 1/3 of an acre. For comparison, 16 homes have sold in Franklin and Key West via the MLS since 1 January 2013; all but one had lots larger than .5 acres and 12 were on an acre or more. A lot of my buyer clients will target an established neighborhood with character with relatively inferior houses over a new construction neighborhood that has been moonscaped. Keep in mind that Franklin and Key West, while technically rural and “country” are only a few miles from downtown Charlottesville – 12 minutes at 11 o’clock at night, per Google. This is why, when advising buyer clients, we look beyond the four corners of the property – knowing the new neighborhoods and developments that are likely to come is critical. What the effects will be – infrastructure, noise and light pollution, school populations – and so much more – factor into the homebuying evaluation equation. 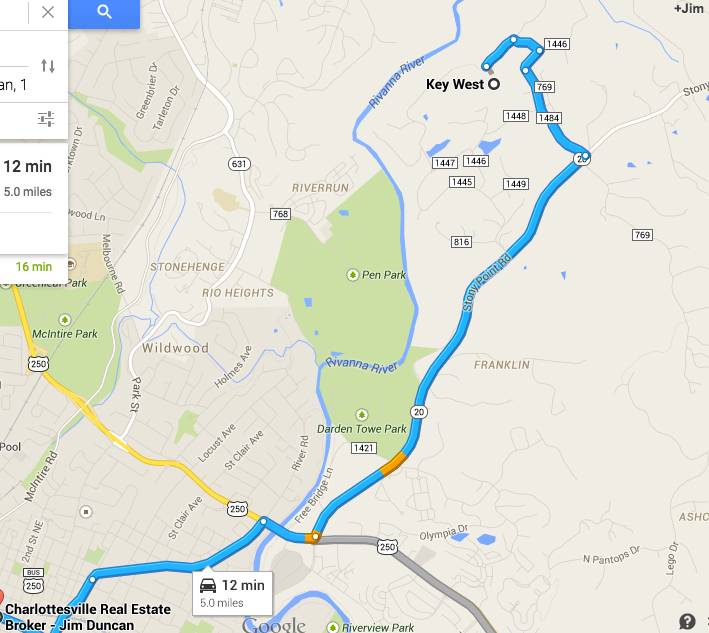 Albemarle Debating Expanding the Growth Area – How should the County Grow? 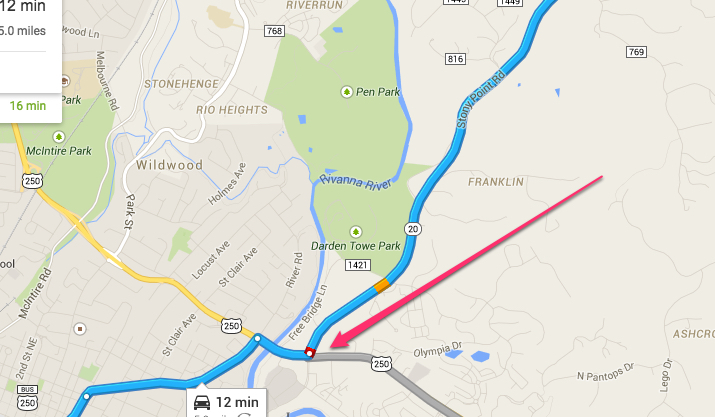 And just because I was curious to see the bottlenecks develop … Free Bridge is the obvious choke point into Downtown Charlottesville.